In our exploration of teens’ digital technology ownership, we wanted to capture both what teens “owned” — sometimes a tricky concept within families where devices are often shared — and what technology tools teens can access. The survey question that asked about devices asked teens whether they “have or have access to” a list of five tools: smartphones, basic cell phones, desktop or laptop computers, tablets and game consoles. Below is a discussion of teens’ ownership, access to and use of these devices. Fully 88% of American teens ages 13 to 17 have or have access to a mobile phone of some kind, and a majority of teens (73%) have smartphones. Smartphone users skew more toward older teens with 76% of 15- to 17-year-olds having a smartphone, compared with 68% of 13- to 14-year-olds. About a third of teens (30%) have a “basic” cell phone that is not a smartphone. About 15% of teens have both types of phones. Of teens with a smartphone, 21% also have a basic cell phone. On the flipside, half of teens with a basic phone also have or have access to a smartphone. African-American teens are the most likely of any racial or ethnic group to have or have access to a smartphone; 85% of African-American teens report smartphone ownership, compared with 71% of white and 71% of Hispanic youth. Teens from higher income families and households where parents have higher levels of educational attainment are among the most likely to own a smartphone. While 77% of teens whose families earn more than $50,000 a year have a smartphone, two-thirds (64%) of teens from families earning less than that own one. Those teens with lower incomes are the most likely to have a basic cell phone — with 39% of teens from households earning less than $30,000 annually reporting basic cell ownership compared with 28% of teens from households earning more. Fully 87% of American teens ages 13 to 17 have or have access to a desktop or laptop computer, and 58% of teens have or have access to a tablet computer. White teens are more likely to report having a desktop or laptop computer — with 91% of white teens owning a desktop or laptop compared with 82% of Hispanic youth and 79% of African-American youth. Household income and parents’ educational level are also factors in teens’ access to desktops or laptops. Teens whose families earn less than $50,000 a year are less likely to have access to a desktop or laptop, though even among these groups, eight out of ten teens (80%) have these machines. And among more well-to-do teens, 91% own or have access to desktops or laptops. As with larger desktop and laptop computers, family income plays a role in whether teens have access to tablets. Fully (46%) of teens from households earning less than $50,000 a year have access to a tablet, while closer to two-thirds (63%) of wealthier teens have them. There are also modest gender differences in tablet access, with 62% of girls reporting access to a tablet compared with 54% of boys. There are no differences by race or ethnicity in tablet access. Some 81% of teens 13 to 17 have or have access to a game console such as a Playstation, Xbox or Wii. Fully 91% of teen boys own game consoles, while 70% of girls say they have or have access to a console. White teens are a bit more likely than Hispanic teens to have a game console with 85% of whites and 84% of African-Americans3 owing consoles compared with 71% of Hispanic youth. Teens in households earning less than $30,000 annually are less likely to have a console, though about two-thirds (67%) of these families have them. By contrast, 83% of families earning more own console game systems. 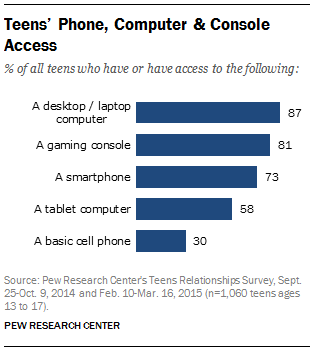 Overall, teens have relatively robust levels of access to tech devices. The majority of youth have access to three or four of the five items asked about on the survey — desktop or laptop computer, smartphone, basic phone, tablet and game console. Fully seven-in-ten teens have or have access to three or four of those items; about 1% of teens own no devices and just 4% say they only have or have access to one.